Wahnsinn wie die Zeit verfliegt! Mittlerweile ist der Beginn meines Austauschjahres mehr als vier Jahre her und mein nächstes Auslandsabenteuer steht bevor. Dieses Mal geht es im Rahmen meines Studiums nach Neuseeland. Also falls hier noch jemand vorbeischaut könnt ihr gerne mal bei www.juliainnewzealand.wordpress.com gucken. In der Zwischenzeit habe ich mein Abitur gemacht und studiere jetzt im vierten Semester International Tourism Studies an der Hochschule Harz. Ich war jeden Sommer wieder in Kanada und habe meine Gastfamilie und Freunde dort besucht. Mit etwas Abstand kann ich also sagen, dass das Jahr in Kanada mein Leben verändert hat und ich dort eins der bisher schönsten Jahre meines Lebens verbringen durfte! Ich habe dort ein zweites Zuhause gefunden, was ich zwar ständig vermisse, aber wofür ich auch unglaublich dankbar bin! Viel Spaß beim Lesen meines neuen Blogs! Now it has been over a month since I came back to Germany. I spent my whole August in South Africa and now I'm back in Germany for real. Wednesday I have to go back to school, my Canadian people do too, and it feels so weird and surreal! I'm happy to be back although I still can't quite realize that I'll stay here for a while now. From Friday July 26th to Sunday July 28th we had the Returnee Camp from my exchange organisation. The picture you see is the group picture. 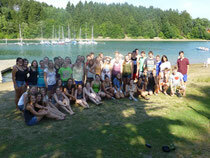 We stayed at a lake, talked about our experiences, did outdoor activites and just relived our exchange in our minds. It was a great weekend, with very nice people, good food, excellent weather (it was almost too hot!) and it was great to exchange all our thoughts with the other students. It was really fun and I can only recommend it to other Returnees thinking about going! You'll have a great time and be glad that you went! I'll probably write again after a little while and tell you how it is to be back in school and about everything else! So as you all know I'm with my German mom since Tuesday. People have asked me to do a last blog and this is it. Once I'm back in Germany I'll write about how it is to be back, how the returnee camp was and stuff like that, but this will be my last entry from Canada. I'm traveling through Alberta and British Columbia with my mom now before we fly back to Germany. If you want to see pictures you can do so here! As I already said I'll enjoy traveling right now and I'll write again once I'm back in Germany and I have stuff to talk about as always. I would like to thank everybody who read my blog over the past year and was by my side on this incredible journey! If you have any comments or questions I'd greatly appreciate them! My name is Julia, I’m 15 years old and I’m from Germany. 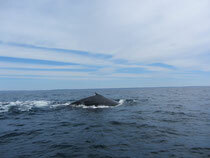 I spent ten months in Nova Scotia from September 2012 to June 2013 and I had the time of my life. I lived in Digby, which is in the South-West of the province and the NSISP did a great job finding the right host family for me. I had two amazing host parents, a little dog and a cat and over the past months they became my second family. I went to the Digby Regional High School and quickly became a part of it. Canadian school is so different from German school. Everybody is really friendly, the courses are great and the relationship between students and teachers is amazing. We were about twenty internationals from all over the world and we all quickly became friends. It is amazing to be part of such a group with so many cultures and personalities but everybody understands each other and wants to be friends. Two of my best friends that I found in Canada are Internationals and who would have thought that I have friends all over the world now that will always have an open door for me ? After a few weeks in school I found my first Canadian friends. Of course everything was really new and friendship has to develop and grow but as time passed by some of them became really close friends. Because DRHS is such a small school you quickly know lots of faces and I was able to say hi to lots of people in the hallway. With the new classes in the second semester I found lots more friends and my best friend here in Canada. If you have trouble deciding if you want to go for one or two semester, go for two. It’s definitely worth it. In the second semester you are used to everything, have friends and a second family and you can enjoy everything a lot more. The second semester also flies by, I don’t even know where the time went. Outside of school I enjoyed being part of the local Digby Dance Studio and taking classes in hip hop. I also did zumba and tried out for the school softball team. We sadly didn’t have a softball team, because we weren’t enough people trying out, but softball is definitely an awesome sport and if you get the chance you should try it. Doing stuff outside of school is definitely a good and valuable part of being an exchange student, because you get to know lots more people and it’s really fun too. Obviously I also really enjoyed hanging out with my friends and doing trips with my host family. I was so lucky that I was able to see lots of Nova Scotia with my family. Another thing that is a very big and fun part of being an exchange student in Nova Scotia is the trips that the coordinators organize once a month. All the Internationals of your area come together, for me it was Digby, Weymouth and Westport, and do a day trip. We did an arrival camp in September, we went skiing, curling, to Halifax, to Peggy’s Cove, had an International supper and lots more. They were always really fun and a great way to exchange little cultural things and learn other languages. Being part of that group of Internationals changed my opinion and view of lots of countries and the world. It made me become a different and better person. I’m more open-minded, have less prejudices and I have friends all over the world. The NSISP also allowed me to see more of Canada. They offer two one week long trips in the fall and in the spring. I went to Toronto & The Niagara Falls in October 2012 and to Montréal & Ottawa in March 2013. Both trips were really fun and I got to meet so many more people from all over the world. We had a great program and got to see so many nice places. 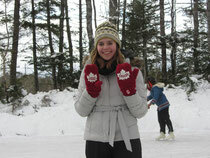 You see an exchange in Nova Scotia is so much more than just learning English. It’s living away from home for a year, but finding a second home in one of the most beautiful places in the world, finding a second family that will always have you in their heart, making friendships that will last a lifetime. I had the time of my life here in Nova Scotia and leaving this place just breaks my heart. I hope that one day I’ll come back to visit this wonderful place and my second home. Thank you to the NSISP for making my year what it was! Thank you to my Canadian family and friends for making this place my home! Thank you to my International friends for being what they are and making me to the person that I am today! And last but not least thank you to my German family and friends for making this possible and not forgetting about me! I hope this gave you an impression of what an exchange in Nova Scotia can look like and to everyone that’s still coming here: I’m a little jealous but I wish you the best of luck and lots of fun! Hope to see you soon Nova Scotia! Last week plus today was my last week of regular classes at DRHS. It was so hard to believe and I still don't believe it. This week is exam week I have my Math exam tomorrow and my English exam on Friday. Then I have to come on Friday, June 28th, to get my report card and that's it. I can't believe it and probably won't be able to believe it until it actually happened. Last Wednesday in the first period one of the teachers, he was my French teacher in the first semester, had his annual concert. He has a little band and they play all kinds of country, rock'n'roll, blues music etc. It was really funny and fun and we had a great time there! In the second period my Child Studies course went to the childcare center here, it's like a kindergarten and we spent about an hour and a half visiting the children and playing with them. It was a fun time and the children were so cute! The last two periods after lunch were the award ceremony. Everybody that participated acitvely in extra-curricular activities and earned points for that or was the most valuable player or the coache's pick to get an award got one. It was great to see that all the kids are happy and proud about what they do for their school and that they are recognized by the school and the coaches for what they do. They also gave the international students their certificate for being and studying in Nova Scotia and at Digby High. Every International Student in Nova Scotia gets that, but our school included it in the Awards Ceremony. That means every international was called to the front by their real name, which resulted in lots of laughter when all of us were called, especially the Asian students. It was just funny because our principal wasn't able to say any of our names right :) That was cool and now the whole school knows us, because we went in front of the whole school to get our certificate. They even filmed the whole ceremony, but I'm not sure for what purpose and where it'll be able to be seen. That's about everything I can tell you. I'll go now and enjoy my last two weeks!